When I was digging through my great grandmother's recipes recently, I found a recipe labeled "Pauline's Rhubarb Crisp", written in Granny Besse's neat script. Pauline was my great great aunt, and I called her Poppy. My rhubarb hasn't had the best year ever, but I had enough for a crisp, so Cort and I headed to the garden to gather some rhubarb. Below, I've typed the recipe exactly as it reads. Place 1/2 of above mixture in an 8x8 pan. Add 3 1/2 to 4 cups finely cut rhubarb. Put rhubarb on top. Pour on top of rhubarb. Add remaining crumbs to top of mixture. Bake at 325* for one hour. Pauline leaves in oven 'til oven cools. Readers, do you have any recipes that have been passed down through generations in your family? Oh my, this looks just like my Granny's recipe! I'm going to have to make this. Thanks Lisa! I am going to have to move my rhubarb to a different spot. It didn't do good again this year. 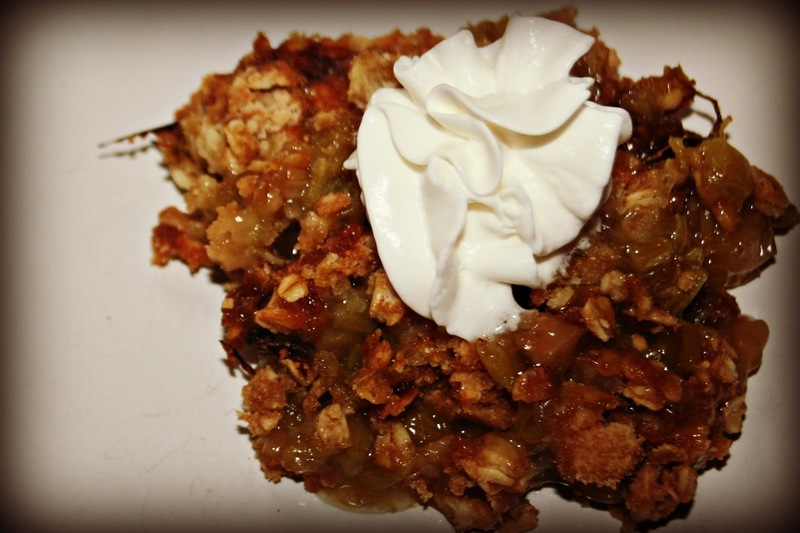 That Rhubarb Crisp looks so good. I need to go eat my breakfast. my grandma would use rhubarb in her strawberry pies ... it was so delicious. to come to think of it i have yet to see it in the grocery store in a long, long, long time. i would love that recipe ... will have to check with the in-law to see if they still have her recipes ... some how they stole them all... so silly. but that is what happens sometimes. ha. ha!! I remember what a treat this was during my childhood. I always cut the rhubarb for Poppy. We had three plants behind our corn crib and she didn't have any. (Carolyn and I had knives by the time we were five. All kids did back in the '50's.) We could never wait for it to cool in the oven. We always begged her to pull it out and give us some. She fussed about it, but she always did. I remember how the ice cream would melt over the top and the smell was incredible. I haven't had rhubarb since I was a kid. It grew in our back yard. We used to just pick it and eat it. Yeah, can't imagine doing that now. I seen some advertised locally. I may just have to buy some and try your recipe. I have my grandmothers recipe for French cake. THANK YOU!!! I just picked a bunch today and was going to look for a recipe! I haven't had rhubarb since I was a child. I'd like to try it again, and your recipe sounds good. I have a lot of my mother's recipes (she doesn't cook anymore). How special to have this yummy recipe. Unfortunately my family, while big on cooking, doesn't have anything written down. I usually use the River Road cookbook if I want authentic Cajun, as it most resembles my grandmother's cooking. How very special to have this recipe. It looks/sounds delicious. Hope you and the boys have a great afternoon. Oh boy, that looks delicious. Recently my grandma let me look through her recipe box and there were lots of treasures in there! I have some rhubarb I need to bake. This sounds great! Oh my, Oh my...it is delicious...How can I resist? Hooray Lisa! I can't wait to try this!! It looks so good, and my rhubarb is still going strong! That looks SO good! My mom used to make rhubarb pie for my late brother. This was when we lived in Washington state, and whenever she could find it. This looks great! Just used up my rhubarb yesterday or I would have tried this. That looks delicious. Thank you for sharing your recipe. I have my mom and grannie's old green metal recipe box. No one is named Bess anymore! Well, Elizabeth. My great grandmother was called Bessie. This sounds wonderful! My husbands grandma passed me her Rhubarb Custard recipe, which is an amazing pie (no strawberries). We've got lots of old Polish recipes--none of which is healthy...but they are delicious! I'm a huge, huge, huge rhubarb fan! That looks so good! I don't grow any rhubarb. My husband doesn't like it, but I do! Usually I make a crisp with June Berries AKA Service Berries. That to is good, but I think rhubarb is the best! I love all "Crisp" desserts. Yummy! I almost bought some rhubarb at the farmers' market a couple weeks ago, but didn't know what to do with it if I were to have bought it. I'll have to buy some and try this recipe.